Welcome to Northern Nevada Gold! 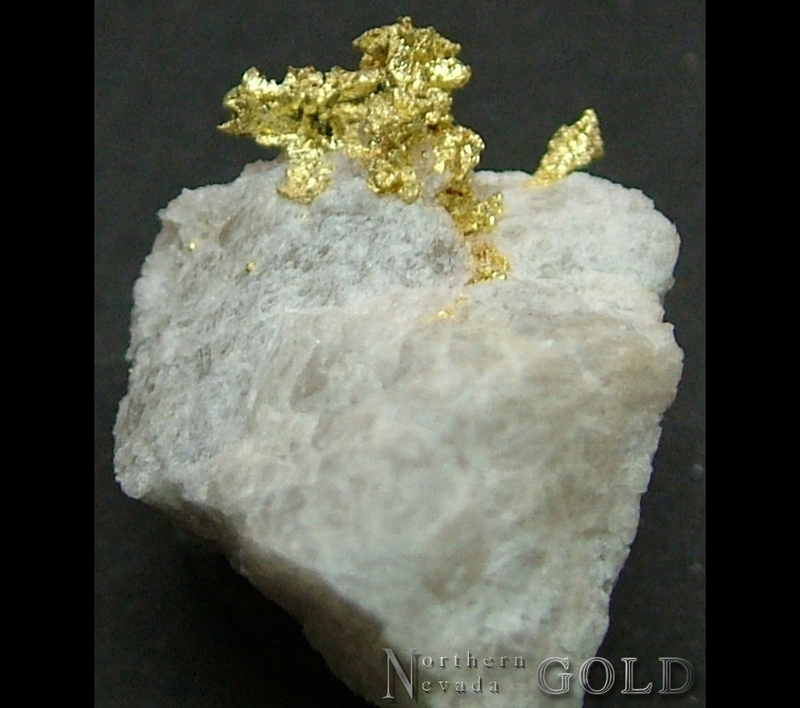 Your online source for gold nuggets, specimens, and more! 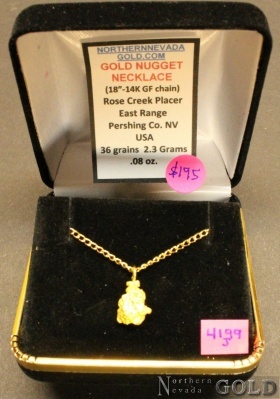 For more than a decade, Northern Nevada Gold has sold mineral specimens, nuggets, and gold nugget jewelry online. Our world-class specimens are ideal for classroom education, training, investment, gifts, or simply enjoyment. 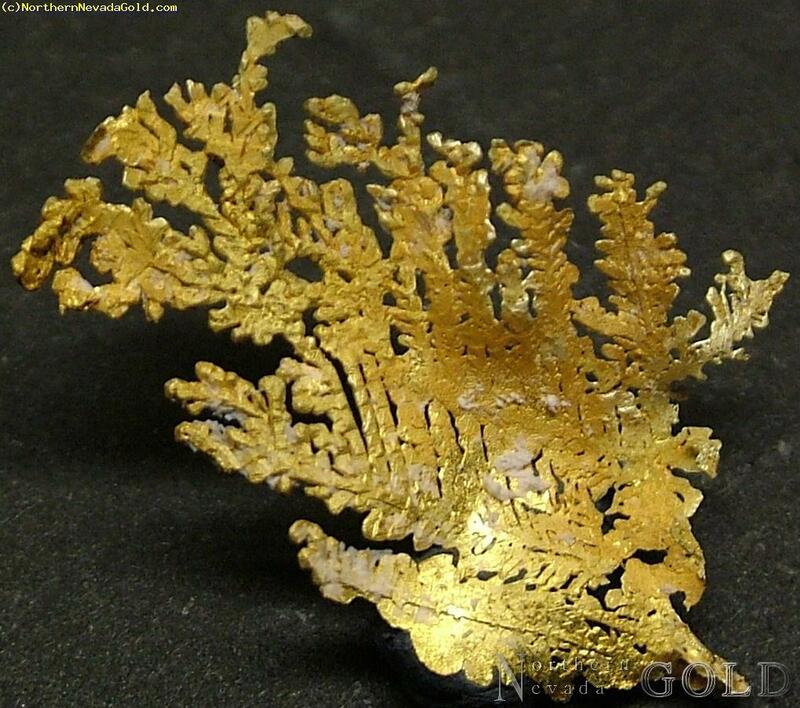 Specimen gold is generally found and retrieved from lode gold deposits. These are usually high-grade occurences found in quartz veins, or less commonly calcite. Gold may also be found as specimens in, or with iron oxides, adularia (a low-temperature feldspar), sulfides, and with other silica-rich minerals such as tourmaline, amythest, or clay minerals. 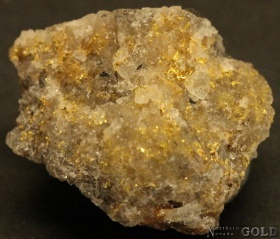 Gold nuggets are created in nature as a result of the surface weathering processes on high-grade gold bearing quartz veins, or rarely other types of geologic gold deposits. MONSTER!! A specimen from the Seven Troughs Mining District. Gold occurs as deep, orangish-tinted blades, leaves, ribbons, blebs, and micro dendritic crystalline structures along tiny fractures. Matrix is a fine-grained quartz. This piece represents a segment of a 1 3/4 inch Quartz vein. From an old collection. 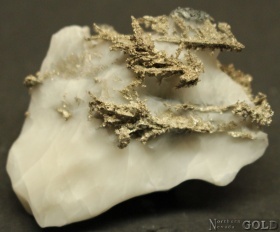 A specific gravity determination indicates 1.53 ounces contained Gold. 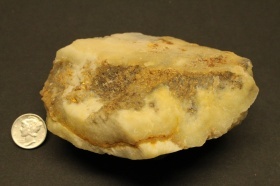 Specimen of Crystalline Gold from the Golden Amethyst area. Gold is hosted in tiny, clear, sparkling crystallized Quartz. Brilliant lustered Gold occurs as very small, orangish-yellow, leaves, ribbons, and disseminated grains. 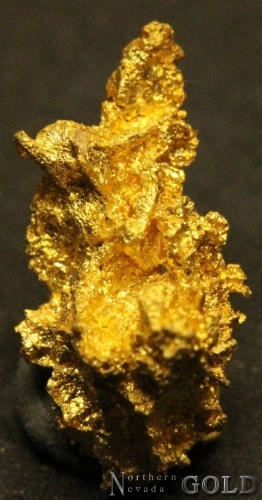 A specific gravity determination shows 20.4 grains contained Gold. 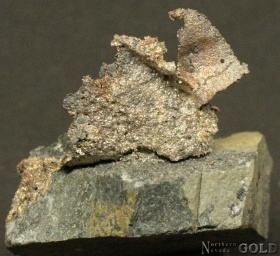 A nice small, crystalline, Gold specimen from an old, historic, Nevada, Gold camp. Gold shows brilliant luster, and an orangish-yellow color. Splendid specimen! 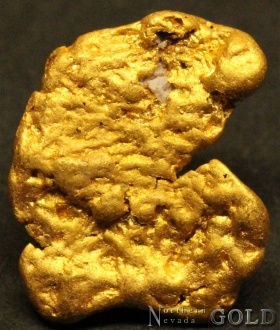 A stunning, robust, Gold nugget from the Rich Hill mining district, Stanton, Arizona. Shows soft, velvety luster, and a rich, orangish tint.. as well as an interesting, classic, water worn shape. Tiny % Quartz remains. Found using a metal detector in this old, historic, Arizona Gold camp. Weighs .54 oz. Splendid nugget showing rich, buttery-yellow color, and very bright luster. Approximately 40% Quartz matrix by volume, remains. Very interesting character. Found in the Gold Basin placer fields, near the White Hills, using a metal detector. Weighs .19 oz. Superb specimen of silver-metallic allargentum pseudomorphs after dendritic dyscrasite crystals in calcite. Dyscrasite crystallized first, then partially altered to allargentum, while maintaining the original dyscrasite form. Exhibits very bright luster and silvery white color. Very strong dendritic format. Trace dark gray Acinthite?? Calcite matrix. CRYSTALLIZED SILVER, ALLARGENTUM, and DYSCRASITE!!!!!! A stunning specimen of the rare, inter-grown, complex, and unique Silver-Antimony minerals named Dyscrasite, Allargentum, with Native Silver. These crystals are intricate and well formed in a fine arborescent (branching) habit. Exhibits gleaming luster and a fine silvery-grey color. Silver also shows wires, blades, and leaves. There is another dark gray crystallized mineral present?? (Acanthite?) The matrix is Calcite. Found in the Bouisma mine, Morocco, Africa. NATIVE SILVER!!!!! Crystallized Silver leaf specimen from historic, Cobalt, Ontario, Canadian mines. Small piece, exhibits bright silver metallic luster, curious character. 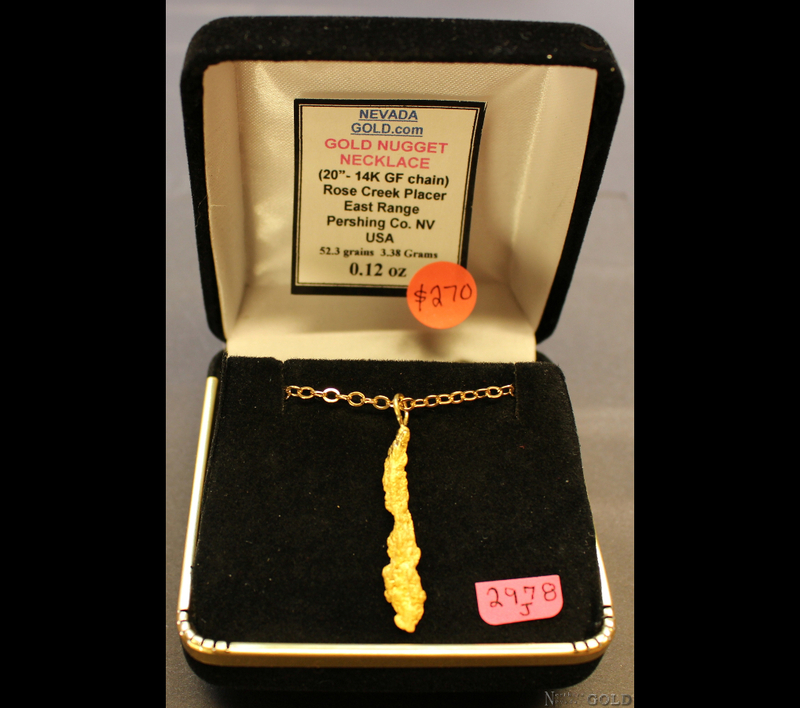 A small, simple, yet awesome Gold nugget from the Rose Creek placer. 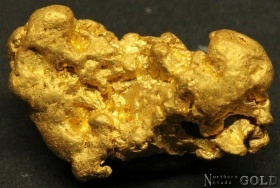 The Gold nugget shows bright, lively luster and a rich yellow color. Sound piece, no Quartz matrix remaining. Has a 18 inch, 14 karat gold-filled chain and 14 karat spring ring and jump ring clasps. Nugget weighs .08 ounce. 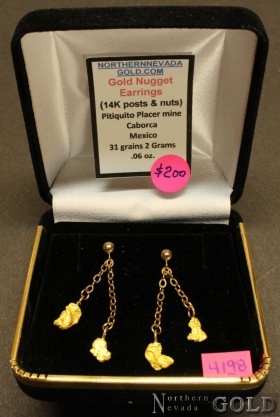 GOLD NUGGET JEWELRY: Dangle Earrings. Nicely matched nuggets from the Caborca placer fields of Mexico. Gold is solid, shows bright, lively luster, and unique character. Posts and nuts are 14 k. Total weight for all nuggets is .06 ounce. 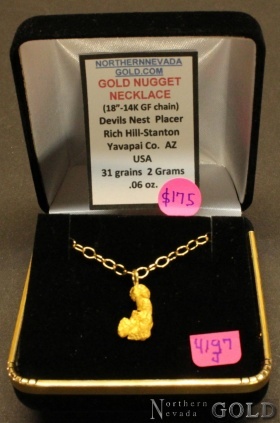 A lovely and splendid Gold nugget necklace from the Devils Nest Placer in Rich Hill, AZ. The nugget exhibits bright luster and a vibrant honey-yellow color. Has a 18 inch, 14 karat Gold-filled chain and 14 Karat Gold clasp. Nugget weighs .06 ounce. A great affordable bag for the beginner, or person who just wants to try Gold panning. 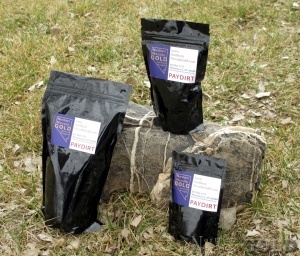 Every bag guaranteed to contain real placer Gold. See recommendations below. Shipping and handling $5.00 Foreign orders subject to actual shipping costs. Every 1 Pound Bag contains a guaranteed amount of one Gram of real placer Gold. Ideal material for testing your skills with a Gold pan, or Gold wheel. It is highly recommended that a person pans this material over a large plastic, or metal wash tub so that the Gold wont be lost. This assures that the panning experience can be repeated over and over for continued enjoyment. 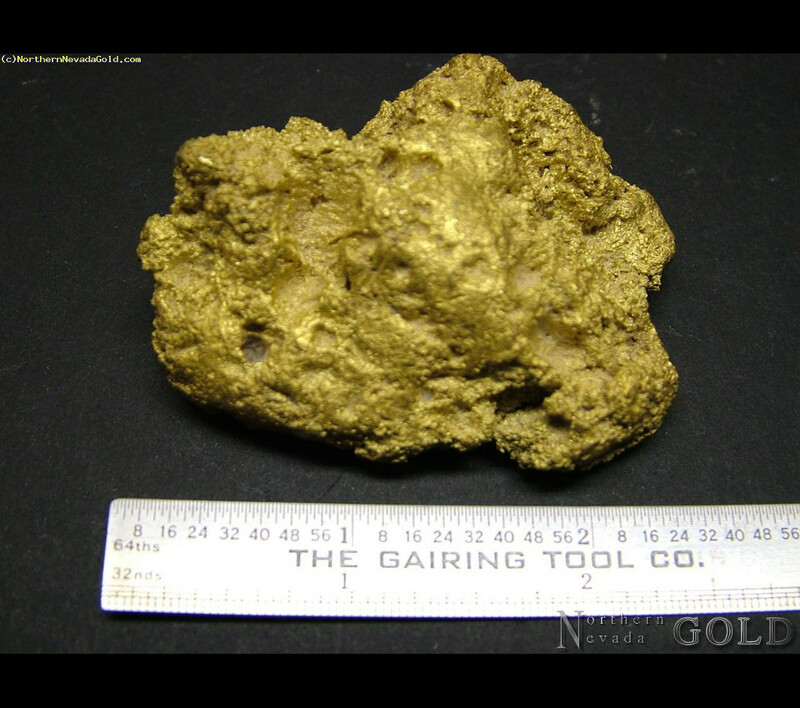 This material will contain 2 Grams, guaranteed, of real placer Gold. Both size bags contain black sands (Magnetite) however this 3 Pounder may contain larger size nuggets. This material is recommended not only as a panning concentrate but also as a calibrating material for testing your dry washer or high-banker. Again, it is advised that you try re-circulating the spoils to capture all the guaranteed Gold, and to allow you to repeat the process as often as you want. Shipping and handling $10.00 Foreign orders subject to actual shipping costs.